The Newest Mini game Fly Fu is a side scrolling beat-em-up. You are a very skilled Martial artist named McFly. McFly’s girlfriend Kate Moth has been kidnapped. Your girl has been grabbed by evil Spiders and other small creatures that can be stepped on. 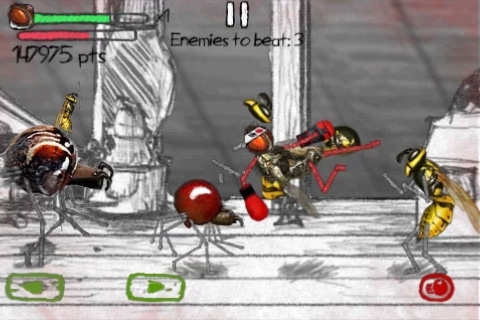 Fly Fu was originally a free iphone app, and is now a PSP/Ps3 mini. The game has 5 levels of brawling action. In each stage you have to beat a certain set of enemies to advance to the next part. 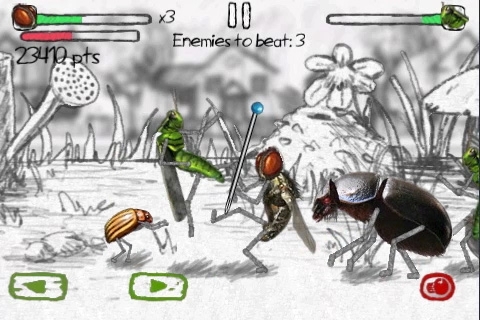 The level backgrounds are in a sketch book style, But the character models are pictures of actual bugs. Beetles, Bees and a bunch of other insects are here for you to beat down. Overall for a mini, the game Levels and characters definitely look unique. At the end of these levels you’ll be greeted by a boss battle. All of the boss fights are pretty easy just like the game as a whole. Punch, punch, Evade then punch again. The Moves McFly pulls off do look pretty cool, but the combat just doesn’t feel right. Mashing buttons together should work, but handling the fly feels sluggish and isn’t even close to touching Final Fight or Streets of Rage. After a while the game just gets old. There’s really nothing here that would make you keep coming back. The Game is more like Steven Segal Than Bruce Lee. One shining moment is when your rage meter fills and you go into Berserk mode. Upon entering the mode, you put on a headband and everything is slowed down. You can make enemies explode in one punch and send them into the background (Ala Smash Bros). Speaking of Backgrounds, the B.G. music is well done. The soundtrack is Kung Fu movie themed. Just think of any old school martial arts movie and you have the idea. The game is pretty short, but i think that’s why its a mini. We can excuse this considering the game is about three-fifty. The main selling point is it focuses on brawling, problem being that’s what needs the most work. Cool concept, just not executed properly. If you have money to blow I guess you could do worse. For the rest of you, hold onto that change and wait for another set of minis.